This is a two-day course aimed for software development teams, in order to help them gain an in-depth understanding of Agile and Scrum. This training consists of interactive games and exercises that will challenge students to solve problems that can be faced in real-life situations, when implementing Scrum and Agile into a team. The course includes learning the fundamental thinking of Scrum and Agile, its project management methods and techniques and how to build an efficient Scrum team. Whether they are large teams, outsourcing projects or teams placed in different locations, you will gain a thorough understanding of how to use Scrum and Agile in practice. In our ‘Workshop’ style lectures, we use highly interactive games and exercises led by our Senior Scrum Trainers, with several years’ experience in large led teams internationally including the United States and China. A Scrum Alliance Scrum Master certificate awarded to become a certified Scrum Master. A two-year Scrum Alliance membership. A ShineScrum membership for life giving you the opportunity to free of charge participate in various activities organized by ShineScrum. A HocvienAgile membership for life giving you the opportunity to participate in Agilead Fellow Community with life-time learning support and experience exchange. A hard copy of the CSM training’s content in English and additional hand-outs. Scrum implementation templates and further material recommendation. 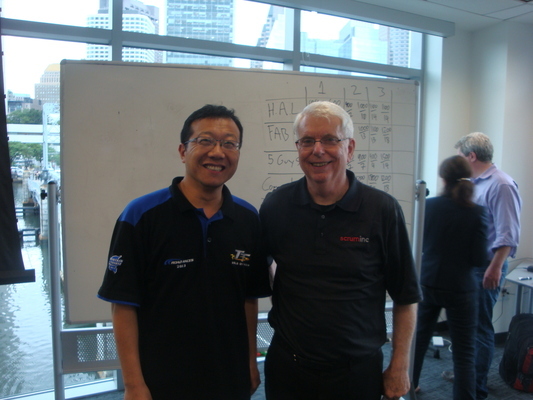 Our partner is ShineScrum founded by Jeff Sutherland – co-author of Scrum. 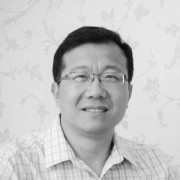 Our trainer, Jim Wang, Certified Scrum Trainer, is a management consultant working with organizations to improve their software development processes. Jim specializes in interactive teaching style. His innovative approach and realistic case studies have proven to be very popular among trainees. In addition, he translated Jeff Sutherland’s and Ken Schwaber’s seminal book “Software in 30 Days” into Chinese. Jim brings a wealth of experience to his customers, having worked with global organizations, training and coaching teams in the US and China, Jim has worked with clients including Gree, Reuters, Oracle, Halliburton, ADP, VanceInfo, Vimicro, Acorn, Dextrys, Citibank, and many other global and Chinese companies. In order to maximize the local adaptation to the learners, our CST trainer will be paired with local expert, Mr. Pham Anh Doi. Mr. Doi is one of the first Certified Scrum Professional in Vietnam, a Board Member of AgileVietnam, organizer of Regional Scrum Gathering Vietnam and many other Agile events in Vietnam. He will help Jim Wang for customize the design and course delivery to make sure learners get the most of knowledge and skills from the course. Doi is an experienced Scrum trainer and coach to several Vietnamese companies such as NAL group, FPT, Techcombank, DiChung.vn etc. Aimed at individuals or companies looking to gain a comprehensive understanding of Scrum and Agile methods. For those who are prepared to import Agile methods into their projects or teams. Standard price is 650 USD per seat. This fee includes for the course and lauch for 2 days’ course and all learning materials. The course will be delivered in a luxury hotel in Ho Chi Minh, according to very high standard from Scrum Alliance for the CSM course.